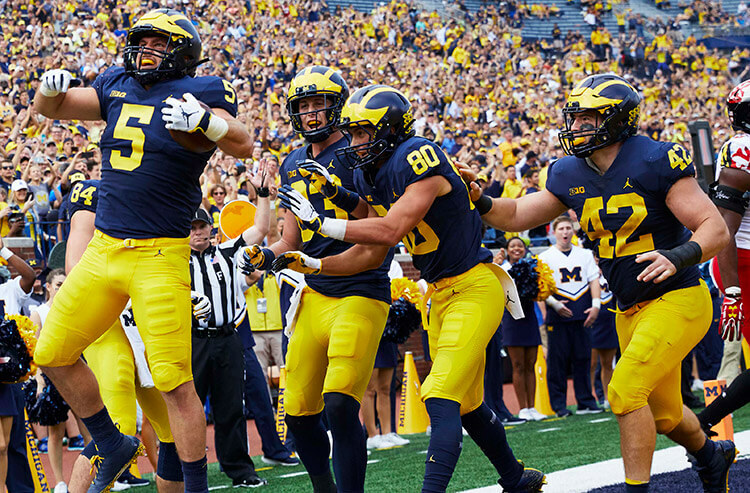 Michigan hopes to have more scoring celebrations in a Big Ten showdown against Wisconsin. Sharp bettors helped move the Wolverines from -7.5 to -10 for the Saturday night matchup. 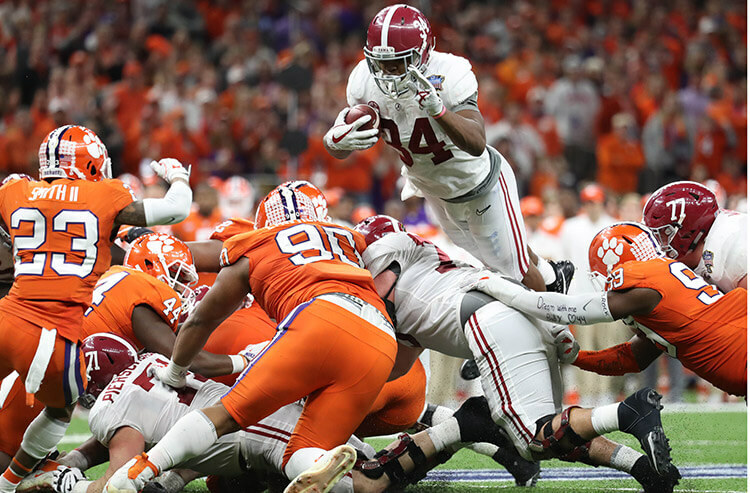 The college football season is ostensibly at the midway mark, with a full Week 7 Saturday on tap. Covers checks in on the action and line movement for several noteworthy matchups, with insights from John Murray, sportsbook manager at the Westgate Las Vegas Superbook, and Nick Bogdanovich, director of trading at William Hill US. Since losing its season opener at Notre Dame, Michigan has peeled off five straight victories, scoring 42 points or more in four of those wins. Last week, the Wolverines (5-1 SU, 3-3 ATS) doubled up Maryland 42-21 as a 17.5-point home favorite. Wisconsin rebounded from a shocking home loss to Brigham Young by winning its last two outings. The Badgers (4-1 SU, 1-4 ATS) dropped Nebraska 41-24 last week, just short of covering the 18-point spread at home. William Hill US books in Las Vegas, across Nevada and in New Jersey likewise opened Michigan -7.5 and were up to -10. That could change with bettors having all day to get down on this 7:30 p.m. ET kickoff under the lights at the Big House. 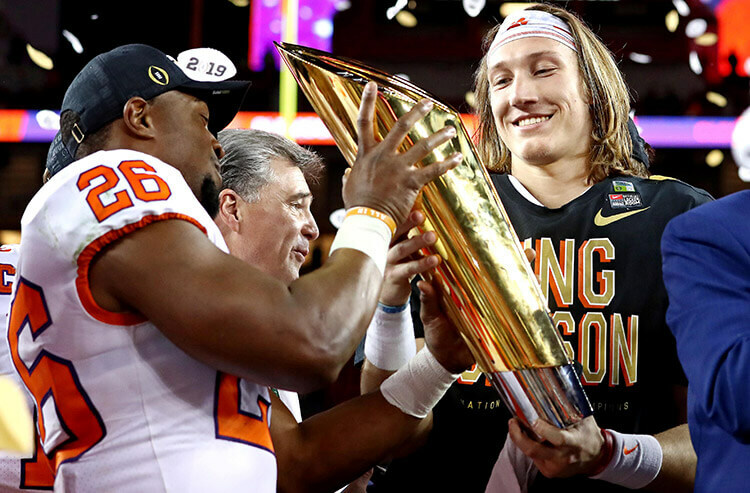 With the first College Football Playoff rankings due at the end of the month, Georgia aims to stay in position for one of the top four slots. The Bulldogs (6-0 SU, 3-3 ATS), who lost to Alabama in the national title game last year, rolled over Vanderbilt 41-13 as a 26-point fave in Week 6. LSU hoped to enter this 3:30 p.m. ET clash with a perfect record, but couldn’t find a way to do so in Week 6. The Tigers (5-1 SU, 3-3 ATS) went off as 1-point favorites at Florida and lost 27-19. The Superbook opened Georgia -7, spent a couple days at 7.5, then went back to 7. It’s not a marquee game, but Nebraska is getting some attention in this noon ET Big Ten contest. The Cornhuskers (0-5 SU, 1-4 ATS) have yet to win under new coach – and former Nebraska QB – Scott Frost, falling to Wisconsin 41-24 in Week 6 as an 18-point road pup. Northwestern had a great chance to upset Michigan two weeks ago and couldn’t get it done, then made up for it in Week 6. The Wildcats (2-3 SU, 3-2 ATS) went to Michigan State as 10.5-point ‘dogs and exited with a 29-19 outright victory. William Hill US opened Northwestern -5.5 and was down to 3.5 Friday morning. “We’re pretty even to it, so obviously sharps are on the ‘dog,” Bogdanovich said. Washington took the loss in a tough opening-week game against Auburn in Atlanta, but is on a five-game winning streak since then. The Huskies (5-1 SU, 2-4 ATS) fended off UCLA 31-24 as hefty 21-point road chalk last week. Oregon enters this Pac-12 border-state clash with a little rest, coming off a Week 6 bye. 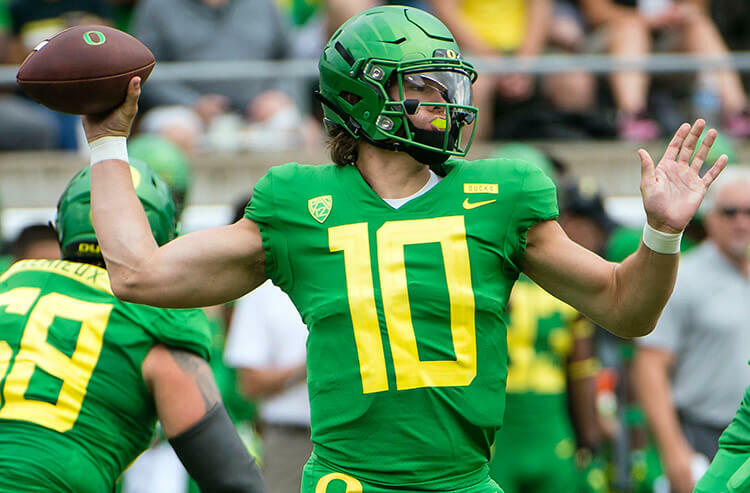 The Ducks (4-1 SU, 1-4 ATS), who blew a golden opportunity to upset visiting Stanford in Week 4, took care of California 41-24 giving 2 points on the road in Week 5. The Superbook was also seeing relatively even action. Southern Cal was dealt losses at Stanford and at Texas in Weeks 2 and 3, but has now won two in a row heading into a Pac-12 After Dark, 10:30 p.m. ET contest. The Trojans (3-2 SU, 1-4 ATS) cashed last week for the first time this year, edging Arizona 24-20 as a 3.5-point road favorite. Colorado enters this game undefeated, but USC surely represents the best team on the schedule so far. The Buffaloes (5-0 SU, 4-1 ATS) topped Arizona State 28-21 laying 2.5 points at home in Week 6. • Army at San Jose State, 3:30 p.m. ET: The Black Knights opened -14, reached 15.5 Friday afternoon and 16 Friday night. “We took a bet at -15 for $100,000, but that’s about it,” Bogdanovich said. The same customer, often dubbed the Duffel Bag Bettor, also hit MGM books for six figures on Army -14.5. • Tennessee at No. 21 Auburn, noon ET: “We’re dead even to it, and there’s not a lot in the pot,” Bogdanovich said. The Tigers opened -16.5 and dipped to -14.5 by Friday morning.